The Call of Duty esports scene, just as with nearly every professional sports and esports, has a large number of polarizing pro players. Whether its their personalities and/or attitudes, as well as rivalries between the teams they play for, players will often attract favoritism from some competitive CoD fans, while drawing dislike from others. However, for various reasons, some pro players find that a lot more fans are averse to them than those that actually like them. In order to determine who the most disliked pro CoD players are among the scene's vast fan-base, Reddit user 'CoD_Doc' created a survey on the competitive CoD reddit page. The survey gave community members the chance to vote for the players they dislike the most, second most, and third most. Surprisingly, and unfortunately for one pro player, the results came back with the same name atop all of the three categories. 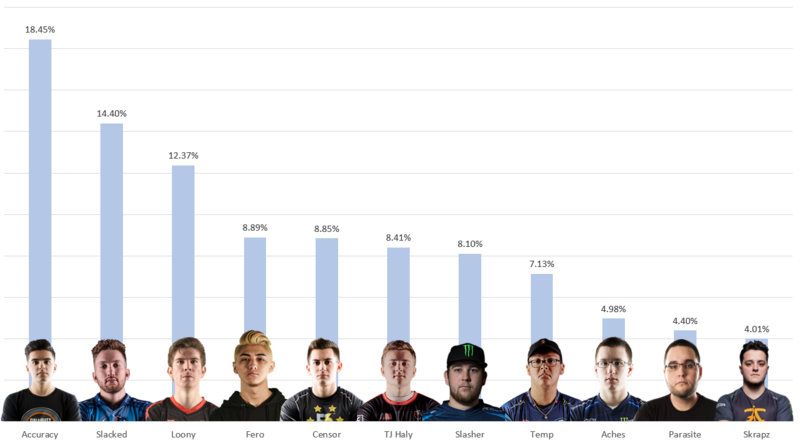 Team Kaliber's Lamar 'Accuracy' Abedi was voted the first, second, and third most disliked player by the community members, essentially giving him the unanimous majority across the board. 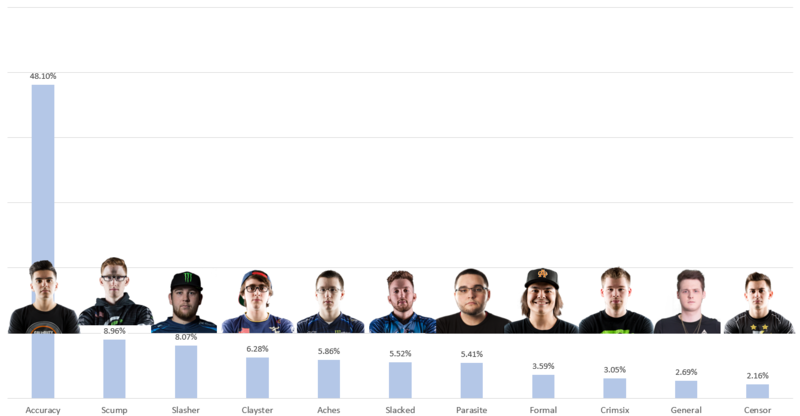 For the Most Disliked category, Accuracy got 48.10% of the votes, a whopping 39.20% more than the second highest tally, which belonged to OpTic Gaming's Seth 'Scump' Abner. For the 2nd Most Disliked option, 27.21% of fans voted for Accuracy, more than double the amount of votes that went for the next name on the list, which was Rise Nation's Austin 'SlasheR' Liddicoat. The trend continued for the 3rd Most Disliked category, as Accuracy took the voting18.45% of the vote, although the margins across the voting for this category were much closer. 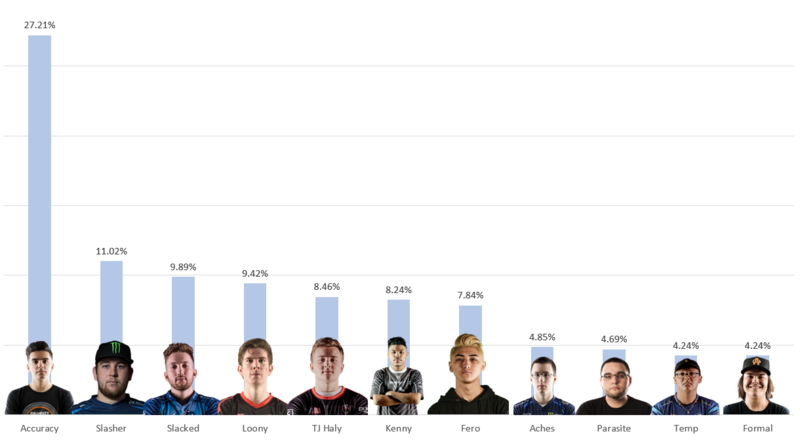 The entirety of the results post for the 'Most Disliked Players' survey can be seen below, or on the official CoDCompetitive Reddit page. Ok... I'll start by saying I almost didn't post this. The last thing I want to do is make the pros think we hate them. I'm going to try and have faith that we won't make this a complete roast-fest and can provide feedback on why players have rubbed us the wrong way. Also, I really want everyone to keep in mind that "most disliked" players are probably even more of a flip flop opinion than the most liked. This means that our least favorite players change ALL THE TIME, and this was from a snapshop in time a little under a month ago. Now that my disclaimers are out of the way... here we go. And Accuracy... I'm apologizing in advance. I actually feel kinda bad. Well... this is awkward. Accuracy accumulated almost 50 percent of all allocated points towards most disliked, to the point that I couldn't fit pictures of people's faces without covering their bar or making the faces too small to recognize. Most of these are the usual suspects and probably gather some hate from rival teams (OG players, Clay, Formal, etc.). However a few of these names didn't appear on the "favorites" list, so its not exactly like they're just getting hate from opposing fans. Notably, Slasher, Parasite and General). *As we established in the last post, Scump is a love/hate type of guy, and we see here the opposite end of that position. However... keep in mind he only netted 8% of the "hate". OK OK we get it... Accuracy. However I'm really interested in some of the names that pop up here that didn't get any 1st place "hate". Most shocking to me is Kenny. He seems like a nice guy to me... I don't understand. Someone explain. Is Slacked's appearance just because of the GA jokes or do people really not like him? Again he seems nice, if a little quick to pull the trigger on GAs. New names to the list include... Skrapz? What? Goofy personality... but I don't get it. Anyways, lets reiterate that while favorite teams are unlikely to change day to day, favorite and least favorite players are, so while this is certainly interesting... be nice?